Sen. John Kennedy, R-La., arrives at the Capitol in Washington, Oct. 4, 2018. U.S. lawmakers heaped more criticism on Saudi Arabia Wednesday amid fresh news reports suggesting that missing journalist Jamal Khashoggi met a grisly death at the Saudi consulate in Turkey earlier this month. "I think Mr. Khashoggi is dead," Louisiana Republican Sen. John Kennedy told reporters on Capitol Hill. "I don't think the aliens abducted him. I don't think he fell through a hole in the space-time continuum. I think he's dead. And I think the Saudis killed him." Kennedy continued, "I think whether King Salman or Prince Mohammed knew about it or not is really irrelevant. They're captains of the ship." Saudi officials have denied they killed Khashoggi. Sen. Jack Reed, D-R.I., responds to a reporter's question on Capitol Hill, Oct. 3, 2018 in Washington. "We have to get all the facts on the table," the top Democrat on the Senate Armed Services Committee, Jack Reed of Rhode Island, told a gathering of defense and national security correspondents, adding that Khashoggi appears to have been the victim of "a grotesque and obscene act by elements within Saudi Arabia." Reed scoffed at Saudi assurances of a thorough investigation of Khashoggi's disappearance, saying an independent international probe is needed. He also suggested putting a pending U.S. arms sale to Saudi Arabia on hold. "At this point, they (the Trump administration) would be wise not to bring up an arms deal to Congress because I think the mood of Congress on both sides of the aisle is this outrageous act can't be followed by a business-as-usual arms deal," the senator said. Sen. Lindsey Graham, R-S.C., departs Capitol Hill, Oct. 6, 2018, in Washington. On Tuesday, Republican Sen. Lindsey Graham said the United States should "sanction the hell out of Saudi Arabia" over the incident and pledged he would never again work with Crown Prince Mohammed bin Salman, describing him as "toxic" and a "wrecking ball." Kennedy said Saudi Arabia must be held to account and face consequences. But he argued against a rupture of relations with Riyadh. "Some of my colleagues say, That's it. We're going to cut Saudi Arabia off like a dead stump.' 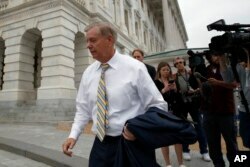 That's magical thinking masquerading as policy," the Louisiana senator said. "With the exception of Israel, I trust every country in the Middle East as much as I trust gas station sushi." Kennedy added, "Here's the problem: We can't afford to have the world blow up as a result of the Middle East. …We can't deal with Iran. We tried. They're a cancer in the Middle East. That means we have to maintain a relationship with Saudi Arabia, and we need to have a better relationship with Turkey. It doesn't mean we trust them. It doesn't mean we shouldn't condemn the kind of conduct we've seen. We should, and we ought to do it very forcefully." VOA National Security Correspondent Jeff Seldin contributed to this report.